Much like China’s Tiananmen Square, Moscow’s Red Square has been the site of historic events and serves as the gateway to some of the city’s most iconic landmarks. The vast, cobbled expanse of Moscow’s Red Square lies at the heart of the city, its history and politics. Originally a market square, it was later used as the site where Russian tsars and the Kremlin’s bureaucrats held parades, coronations and, at times, high-profile public executions. Red Square has featured in some of Russia’s most memorable moments. It was used to display military might in 1941 when tanks drove through it on their way to WW2 frontlines, then during the Cold War when Soviet leaders paraded ICBMs (intercontinental ballistic missiles) through the square to demonstrate their firepower to the West. Today, the UNESCO-listed square draws more tourists than tanks, due largely to the fantastic array of sites that lies along its perimeter. The State Historical Museum and Kazan Cathedral lie to the north-west, next to the sprawling, upscale GUM department store and opposite the colourful domes of St. Basil’s Cathedral. Lenin’s Mausoleum is set on its western edge in front of Moscow’s most iconic site – the Kremlin. While Moscow’s arterial roads radiate outwards from the square, the area itself is closed to traffic, making it the ideal, pedestrianised zone for a day of sightseeing. Lenin’s Mausoleum: This hulking, granite pyramid houses the embalmed remains of the Father of the Revolution, although some speculate that Lenin’s body has since been replaced by a wax replica. The building holds little else than the remains, so visitors are usually ushered through by Kremlin guards fairly quickly. After a security check, cameras and mobile phones must be checked upon entry, and no talking, photos or videos are permitted once inside. Admission is free and the building is open on Tuesdays, Wednesdays, Thursdays, and Saturdays from 10am to 1pm, with occasional closures for maintenance. The Kremlin: Originally home to Russia’s tsars, the Kremlin now serves as the official presidential residence. Within this vast area lie museums, historical buildings, churches, Grand Kremlin Palace and State Kremlin Palace, all of which are open to the public. 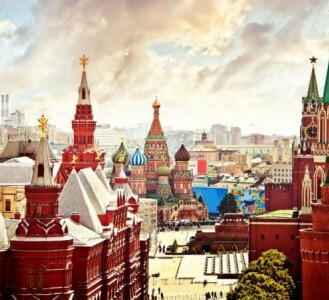 Click here for in-depth information about visiting the Kremlin. The State Historical Museum: With over 4 million objects on display, visitors to the museum can spend hours browsing through artefacts dating as far back as the Ice Age. An admission fee is charged and the museum is closed on Tuesdays. GUM (pronounced “Goom”): The elegant architecture and chic, high-end stores of this expansive department store make it one of Moscow’s premier shopping destinations. In Soviet days, the top floor of the store was only open to high-profile party members but all areas are now open to members of the public on the hunt for designer threads. St. Basil’s Cathedral: Commissioned by Ivan the Terrible in the 16th century, the colourful onion domes of this cathedral have become an iconic symbol of Moscow. It now serves as a museum and visitors can climb a winding, spiral staircase into the interior. Kazan Cathedral: Overshadowed by its multi-coloured neighbour, Kazan Cathedral is still worth a quick look, if only for its historical background. Built in the 16th century to commemorate the defeat of invading Polish forces, it was later demolished and the current replica rebuilt in 1993. While the attractions around Red Square are only open during the day, it’s worth a visit at night when the buildings along its perimeter are lit up. In the winter, a large part of the square is also transformed into an ice rink. Be prepared for long, albeit fast-moving, queues and thorough security checks at some of the sites listed. Most of these attractions are closed for a few days of the week and at certain times of the day, so check opening times and days beforehand to avoid disappointment. Listen out for the “Kremlin chimes” which peal on the hour from the nearby Spasskaya Tower which once served as the official entrance to the Kremlin.